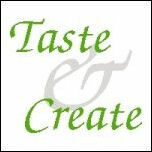 It's time for another round of Taste & Create, the event where you are paired with another food blogger to make one of their recipes, and they in turn make one of yours. This month I was paired with Jen from Beantown Baker. She has a fabulous blog which is overflowing with, amongst other goodies, delicious cupcake recipes. I couldn't decide whether to make some cupcakes or the Brie Bites, which looked very tempting indeed. I printed off the recipes for both and after much deliberation the Brie bites won. They were really easy to put together. I used this recipe to make the filo cases as I couldn't find them over here. After making the cases, you simply put a cube of Brie into each case, bake in a medium oven for about 7-8 minutes and finally pop on some toppings and voila! Simple, quick and delicious! Half of mine were topped with red pepper jelly, and the other half with fig preserves and toasted chopped pecans. The pecan ones were my favourites, I liked the crunch of the nuts against the soft melty Brie - for more ideas on toppings see Jen's recipe. Now, one of my boys spotted the cupcake recipe that I had printed and asked if I could make them. I made half a batch and they must have been good, because when I went to add the cream, caramel and chocolate to photograph them, there was only one left! My son complained that his cupcake had been 'a little bare on top' - well that's what you get for secretly pigging them! And here's the lone Carmel Mocha Cupcake!! Thanks for the recipes Jen, and thanks to Nicole from For the Love of Food, for putting this fun event together. Nic, both the brie bites and the cupcake looks amazing. I can see why your kids got to them before you did. I would have found it hard to resist, too. The brie bites sound amazing. I would use a rocoto jelly on them. Mmmm..yum! And to top them off with those delicious cupcakes. Wow! What a day!!! oh boy, do they look good!!!! I'm surprised you were even left with one cupcake to photograph! Those brie bites would be perfect for Xmas!! 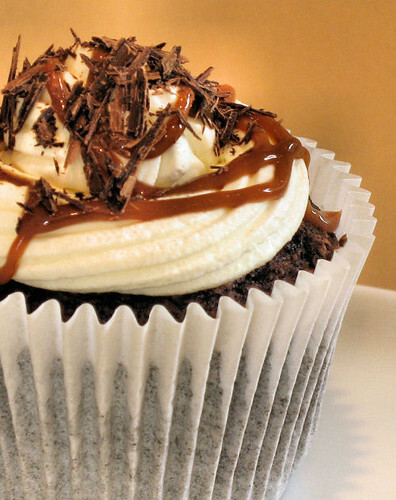 The Carmel Mocha Cupcake looks very tempting. The second photograph is just teasing us. 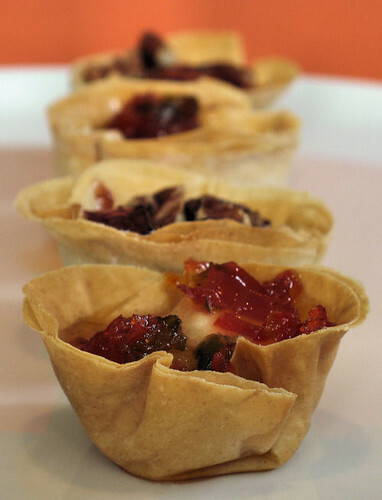 The brie cups would be great for a party... so would those cupcakes actually, they both look great! I love the idea of the Brie Bites. And the carmel mocha cupcakes...how can you go wrong? They look amazing. What a fun-sounding event. I love the look of both of these treats and am not surprised that that the cupcakes vanished quickly! So glad you liked the brie bites and the cupcakes! Any cheese with some kind of preserve is right up my alley. Ginny - it's impossible to only eat one Brie bite!!! Gretchen - I'm betting that rocoto jelly is nice and hot, I've not had that one before. Pixie - yep, so am I! Margaret - they would be perfect for Xmas or any party. Bellini - I am with you there, it's my favourite event too! Brilynn, thanks - bring on the party!! LyB - I guess I was being a bit lazy in not decorating them sooner! Shari - welcome and thanks for the lovely comments. Antonia - you must come and join in next month! Jen - thanks for being a great partner, and for the super recipes! Nina - I agree with you, great combo. Nic I love those brie bites....and the cupcake looks amazing, no wonder they disappeared so quickly! Mmm, I go crazy for brie. It's my favorite cheese in the whole world. God bless the French! The cupcakes look spectacular, as well. Thanks Alfie! Those Brie bites are great aren't they? Emiline - it's one if my favs too! LyB - whoo hoo! Thanks so much!! The phyllo cups look tasty and the Carmel Mocha Cupcake looks so chocolaty and good! Since they're only "bites" does that mean we can eat 3 or 4 of them? They look fabulous! I've yet to bake with brie...but that cupcake looks something to die for!! amazing nics! Love the event and love your choices. Brie is my favorite cheese and those cupcakes-WOW! i can imagine how delicious all those toppings would be with brie. the red pepper jelly sounds intriguing, i have never had it. Oh man, does that gooey cupcake look good. Great photos! That cupcake looks amazing. 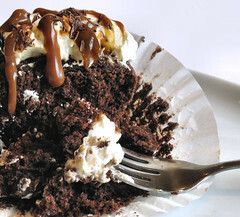 I love the way the caramel drips down the side of the cupcake. Mmmm!!! Thanks Kevin - they were good! Susan - only 3 or 4? I'm thinking a whole plate as they're so tiny! Mansi - go for it, it's lovely! Megan - hi there, it's one of my favs as well. Maybahay - I'll try and do a red pepper jelly post when I make some more - got to wait for our peppers to grow!! Ronell - nice to see you back, hope you had a great holiday! Neen, welcome and thank you! Chuck - thanks and anything with drippy caramel has got to be mouthwatering! Oh my WORD, look at the state of that! I think I've gained a few pounds just LOOKING at that cupcake :) The brie bites look yummu too, and so simple. Must remember that next time I have people round for drinks. Wow, these look fantastic and dare I say it, even better than the original.